One random Saturday, I discovered I'd grown roots in my loveseat after the 6th hour in a marathon of Everest: Beyond the Limit. I've since watched the other 2 seasons and have become obsessed with mountain climbing. More in theory than in practice. Meaning I've purchased some gaiters and a walking pole I use at the park. Since my obsession with mountain climbing began (see above), I found myself starting to actually research beginners' climbing classes. Thinking this was a bit absurd for my indoors/room service taste, I picked up Jon Krakauer's Into Thin Air. I thought it might squelch my interest, which it did. However, it's worked its way on to my top 20 books list. 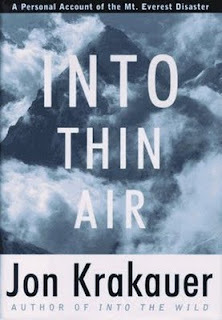 Into Thin Air is a personal account of the deadliest season on Mt. Everest in 1996. Krakauer paints such a vivid picture - I could swear my insides were rolling from the altitude sickness. I was holding out hope for his expedition team, although I already knew 7 would not survive. Page. Turner. Let's say I was actually going to climb a mountain... Beyoncé's new album 4 would be my soundtrack. Sure, I want to be hipster and only love obscure music that no one's heard of and then hate it when they appear on a Billboard chart. But sometimes there's a reason tens of millions of people like an artist. Because. This song, End of Time, is my current fave. I also press repeat on the following: Countdown, Start Over, Best Thing I Never I Had.